Rated and non-rated access panels in stock for quick shipment. 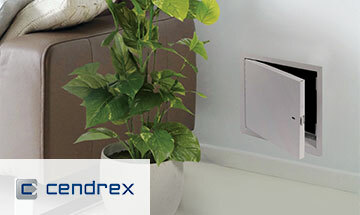 Superior design for a concealed appearance, Cendrex offers quality access panels. Whether rated or non rated we have many wall mount sizes in stock from 6 x 6 up to 48 x 48. We can special order ceiling mount panels to fit your application. Accessories include mortise lam latch, mortise deadbolt, screwdriver cam latch, gasket and inside release. Cendrex has the ability and capability to manufacture access doors in special dimensions to meet your every need.